In our previous post, we learned that for your business to be profitable, your team should be customer-centric. But does that alone complete the digital CRM puzzle? No. If its not about reinventing processes, then its not innovation. If it’s not process innovation, then you’re not digitalizing your business – its all cosmetic and short-lived. Customer satisfaction is the lifeblood of any business. Smart and successful businesses always focus on 'customer relationship' aspect of CRM and they make use of the unlimited possibilities of digital technology. Gaining first mover advantage is critical for their continued growth. When your tech is digital-centric, your team will have a historical view and analysis of the existing customers and prospects. Interaction and purchase along with detailed insights and future action nudges will become the norm. Successful Digital CRM technology comprises of collecting, synthesizing, analyzing, and disseminating the business metrics including financial, operational and customer metrics. Customer metrics derived from this tech will improve your understanding of how to manage customer relationships to better the customer experience, enhance customer loyalty and grow your business. The fact is that you need to make your business team customer centric in their approach and that is exactly where the importance of identifying top quality Digital CRM solution vendors comes in. Today, it is vital that you incorporate digital centric technology in your business work process. Being Digital allows your teams to collect and manage large amounts of customer data that in turn, create and deploy strategies can be carried out based on the data available. Data thus collected also helps a business solve specific problems throughout its in depth analytics pertaining to customer preferences, tight integration with existing products and systems(autonoma integration), easy onboarding, cost efficiency, (almost) instant responses and targeted campaigns relevant to the complete product and customer relationship cycle. CRM data offers new insights into the needs and behaviors of the customers and such feedback allows companies to tailor products to target specific customer segments. The insights garnered can be used to generate solutions to problems outside your businesses marketing function like new product development and supply chain management as well. As you can see, Digital CRM focuses on the holistic approach to growing your business. What do all these aspects indicate? Customer relationship management has become an inevitable part of modern day businesses and, business owners better make use of highly dynamic and focused CRM initiatives to improve their customer relationships and business in general. Otherwise, they will soon be laggards and their very existence threatened. Such a digital centric method of CRM technology will make your business teams highly customer centric and this, in turn, will help you stand taller among the competitors. But keep in mind, making your tech digital centric is not enough. 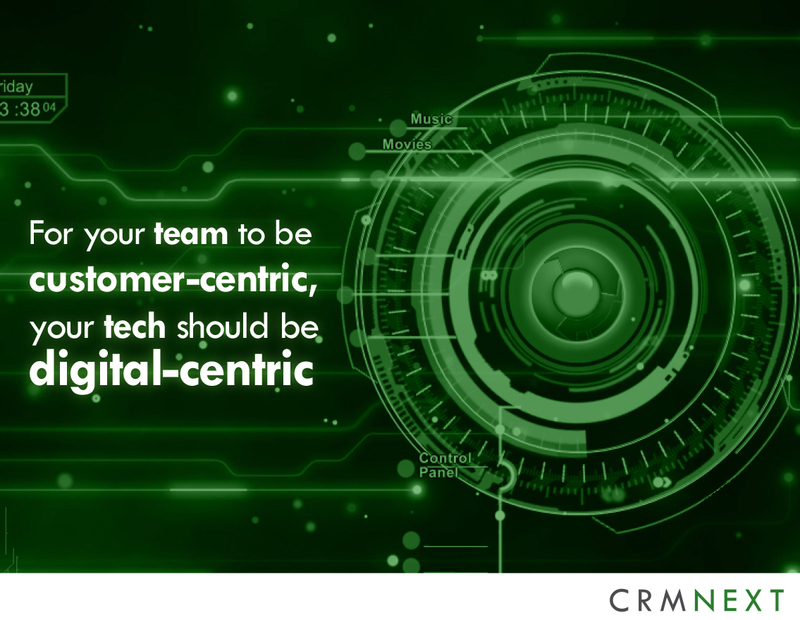 For your tech to be digital-centric, your CRM should be human-centric.